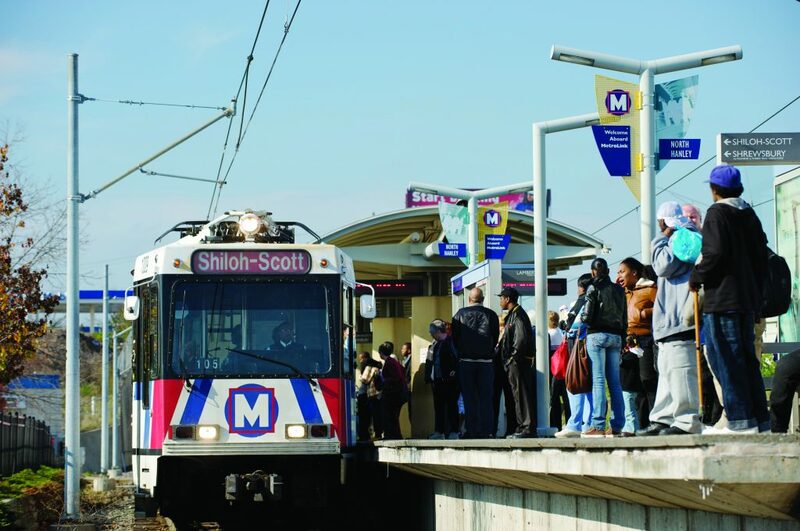 The Bi-State Development Research Institute, a non-profit enterprise of Bi-State Development, has been awarded a $583,958 grant from the Missouri Foundation for Health to launch a pilot program to bring healthier food options closer to Metro riders and residents in the communities adjacent to two MetroLink stations in St. Louis County. The grant will fund an 18-month pilot program for the development and operation of food kiosk markets in North St. Louis County at the North Hanley and Wellston MetroLink Stations. The goal of the program is to increase the availability of fresh fruits, vegetables and other healthy food staples for Metro passengers and residents who do not have convenient access to grocery stores, farmers’ markets or other healthy food providers. The U.S. Department of Agriculture (USDA) Food Access Resource Atlas identifies many areas in the St. Louis region, particularly in North St. Louis County, as locations where there is a lack of access to fresh, healthy foods – commonly known as “food deserts.” A significant number of residents of North St. Louis County live more than a mile from the nearest grocery store, and that is a major concern for individuals and families who not own a car. Between 15 to 45 percent of households in North St. Louis County do not own a vehicle, and that percentage jumps significantly higher to between 45 and 70 percent for residents without vehicles living near the North Hanley Transit Center. By placing the food kiosks at the North Hanley and Wellston Stations, thousands of transit passengers will be able to conveniently access them as part of their regular everyday commutes, saving them time as well as saving them the trouble of finding a ride for special trips to the grocery store. The food kiosks are scheduled to begin operation in 2017. As part of the program, the Bi-State Development Research Institute is also partnering with the University of Missouri Extension to provide nutrition education to kiosk patrons and transit riders. Research shows that education is a critical component to successfully combat food insecurity, and the University of Missouri Extension will provide 36 bi-monthly education sessions to support the food kiosk program, which will be led by nutrition specialists. Customers will be able to ask questions and learn more about the importance of proper nutrition and how to incorporate fruits and vegetables into their diets while on a budget.